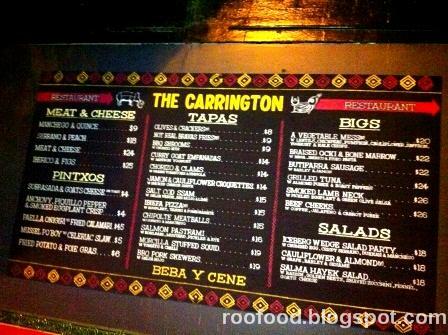 Roo Food: Girls Night Out @ The Carrington Hotel - get your tapas on! Girls Night Out @ The Carrington Hotel - get your tapas on! 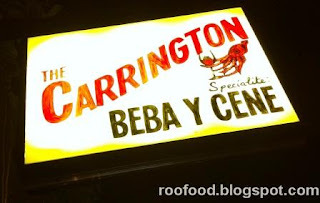 The Carrington Hotel (which is part of the Drink and Dine Group who also own pubs such as the The Forrester, The Norfolk and The Abercrombie) and more specifically Beba Y Cene, the Spanish inspired restaurant at the back of the bar, has long been on my bucket list of must dos. This is the type of place that serves food that I love - plates to share! Not sure why it's taken me so long to get here and as the new food blogger on the block I am running behind the crowd! So when a girls night out takes me to Surry Hills for happy hour cocktails I also take the opportunity to suggest we head to The Carrington afterwards for dinner. We arrive and its busy, busy, busy (it's a Saturday night after all). Silly me has forgotten to make a reservation and we put our name down on the list to await a table. That's okay, gives me a chance to check out the main bar area too. We head to the bar area for a bottle of wine (between the four of us!) and settle in until a table is ready. The Bledisloe Cup is on so the bar is packed with sports fans with a mix of Aussies and Kiwis barracking for their teams and then there was us girls who weren't that interested in watching it! On our way to our table Luke waves hello from the kitchen as we pass and I feel a bit special - how does he know me? - Is my blog famous already?? (**totes joking**) and I later realise that he has actually replied to my instagram message and I assume he makes the connection as I pass. Nevertheless, I feel very welcomed here. Our waiter Matty settles us into our table and we start to discuss the menu. Immediately I could tell that he was very passionate about the food and suggestions and recommendations were being thrown at us. It's always a pleasure dining when your waiter is enthusiastic about everything! The menu is large with a mix of platters, pintxos, tapas and mains. We are all about sharing plates so we get to sample more, being the little piggies that we are. However a couple of the girls are hesitant towards the 'unusual' types of protein and I assure them they will be fine and need to be a little more adventurous (just don't think about it) - and they agree as long as we don't talk about it in detail! Fair play! We make our selection of four tapas and we think that is enough, however Matty talks us into also ordering a main to share too. The plates come as they are ready and it's not long before the dishes start to arrive. First plate served was a special complimentary dish for us (as the specials had sold out for the evening). Thanks Luke! A slider with smoked corned pork neck with a mustard cabbage slaw (?) forgive me if that isn't 100% correct but it would be close. It now appears I am a bad food blogger if I can't even remember what was in the first dish but in my defence we had already had a few alcoholic beverages leading up to this and my brain may have been having some trouble computing the ingredients! Sliders are the best invention. Perfectly sized and just right as a starter. 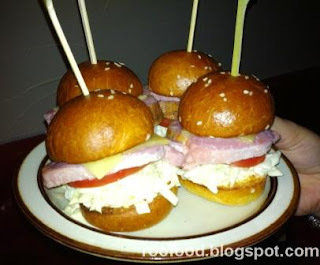 These sliders are tasty, the meat was tender and the slaw slightly acidic enough to cut through the richness of the meat. 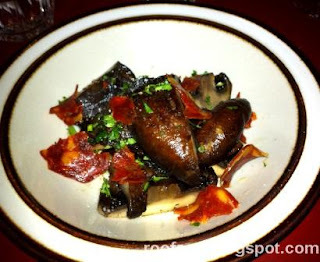 The mushrooms are 'meaty' and smoky and cooked perfectly and with slivers of melty, fatty chorizo this dish was a winner. I can't stop myself from going back for more bites. 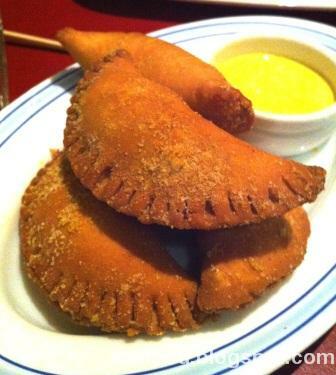 Piping hot these crispy parcels of curried goat are tender and juicy. The goat isn't as gamy as I had thought it might be. The deep yellow saffron yoghurt is creamy and with a hint of saffron. These are little parcels of crispy heaven. I love the saltiness on the crispy coating! I look over to one of my friends and she seems to be good with it. It's a total head game when it comes to some types of food. 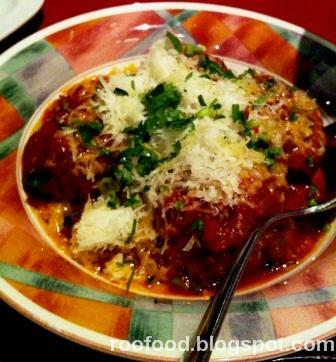 I will admit that I don't often choose meatballs when I'm dining out because more often than not I am disappointed with them. Usually they are dry or to dense or have more filler than meat, however these little balls were a little better than that. Perhaps on the drier side (for my preference) however the sofrito sauce was packed with flavour and who doesn't love gooey, melted cheese on top. This tapas dish was my pick out of the four tapas and I hoped the others would like it. 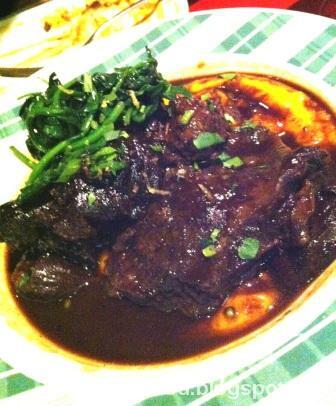 I really like blood sausage and have tasted different varieties throughout my travels. Morcilla is a more subtle blood sausage and paired with the tomato and chilli sauce it is fantastic. It's not overpowering at all. 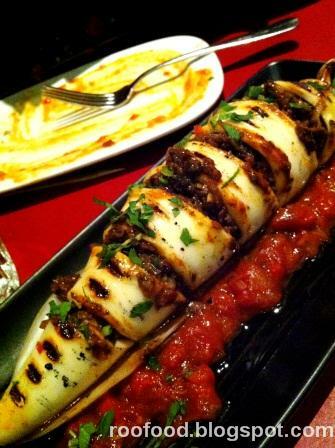 The squid tube is charred nicely and is tender but still with some bite to it. The chilli adds a slight kick to it just to ramp it up a little more! A glimpse over the my friends to see how they have coped with it...their not gagging and they are nodding their heads so that's a great thumbs up! The beef cheeks braised in coffee is rich and deeply flavoured, but its the carrot puree underneath that I keep going back for (even though I'm so full!). Creamy and smooth and amazing it has a hint of jalapeno that tingles the tongue. I think we all just had a moment of silence followed by a groan and moan from each of us as we ate this. Hands down the dish of the night. I reckon I could have just a bowl of the carrot puree and be a contented woman - I don't suppose you guys would be willing to share the recipe would you? I'll keep it a secret I promise! As full as we were by this point, we were coerced into dessert. It seems Matty has a way of selling the dishes (and rightly so, we are a very happy bunch of girls). You just gotta pull out that extra stomach for dessert (and in my case that's a big call) but we decided to share two of the dishes. 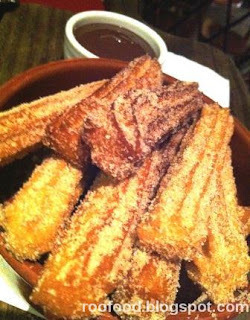 The fried milk was a must do and the churros for one of my friends who loves them. Fried milk has been on the list to try foods and it's also on my list to cook myself. While travelling in Spain many years ago I didn't get the opportunity it sample it, so I took it tonight! The fried milk is custardy and not to sweet and well anything deep fried in my book is always a winner and then dusted in sugar and cinnamon it was just well, amazing. 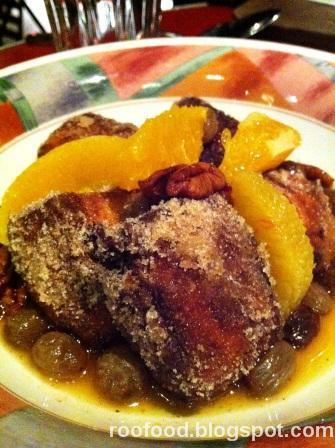 The fresh oranges and the raisin and orange syrup with a smattering of pecans through it I was in love with it. Definitely a must order dish. Hot, sugary and dipped in chocolate what's not to like about these famous little sticks of dough. As the kitchen and restaurant was slowing down for the night I took the opportunity to introduce myself to Luke and to thank him for such a great meal. Luck was on my side this evening too because Jamie Thomas (executive chef of Drink 'n' Dine) was in the house too! Double score. I have been following Jamie and Luke on instagram (and I find myself constantly drooling over their pictures of food) and it's nice to finally meet them in person. They have taken a few moments out of their busy schedule to chat with me and answer questions (and I have held back tonight!) I would talk all night if given the chance - and I have promised to return for Tuesday night Pintxos and also breakfast one weekend soon.